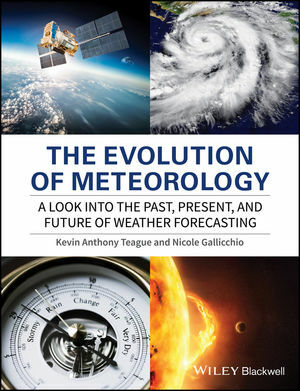 This comprehensive review explores the evolution of the field of meteorology, from its infancy in 3000 bc, through the birth of fresh ideas and the naming of the field as a science, to the technology boom, to today. The Evolution of Meteorology reveals the full story of where meteorology was then to where it is now, where the field is heading, and what needs to be done to get the field to levels never before imagined. Authored by experts of the topic, this book includes information on forecasting technologies, organizations, governmental agencies, and world cooperative projects. This enlightening text explores in full the history of the study of meteorology in order to bring awareness to the overall path and future prospects of meteorology. Kevin A. Teague and Nicole Gallicchio are the cofounders of Forecasting Consultants LLC, a private weather forecasting and forensic company geared towards a multitude of industries and users. Their business has allowed the authors to grow and expand their knowledge base in all aspects of atmospheric science.